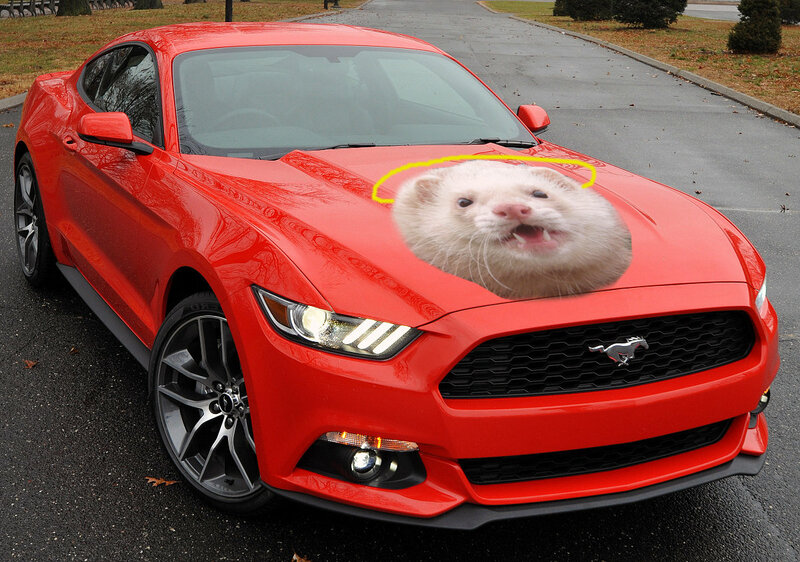 Ford announced that it will counter the upcoming Dodge Challenger Hellcat with a new version the Mustang to be called the Heavenferret. Spokesferret Jay Soncampeight described the Mustang Heavenferret’s engine as a twin-turbocharged, quad-supercharged 7.5 liter V8 producing “eight hundred plus” horsepower and “I’m not sure but whatever it is it’ll be more than Dodge” lb-ft of torque. Asked about the Heavenferret name, Soncampeight explained that ferrets tend to be owned by young, trendy, forward-thinking individuals, while cat people tend to suffer from low self esteem, unfulfilling personal relationships, and chronic Toyota ownership. General Motors would not comment on plans for a competing vehicle, but an anonymous company representative named Fred told Autoblopnik that Chevrolet is considering an 11-liter, 1200 horsepower version of the Camaro to be called the Purgatorychicken.
. it is so stupid it is funny.. I really dont think ford has to do anything since the gt500 is at 662hp... But isn't this the last year for it? Alan.... you have too much spare time of your hands. Do something productive for change! I have a feeling if it comes with a boost gauge Speedys going to be all over that thing .